I would probably eat anything if it was served on grilled bread. It’s in my DNA to love good bread. My father (who I might add hasn’t gained weight ever in his life) eats bread with every meal. Sweets, not so much. Snacking, never. I rarely indulge in bread. Sweets, sometimes. Snacking, it’s my life. My weight, let’s not discuss. Hmmm, maybe I should rethink this bread thing. I saved up my carb calories every day in March for this delectable treat, which I taught in all my classes. 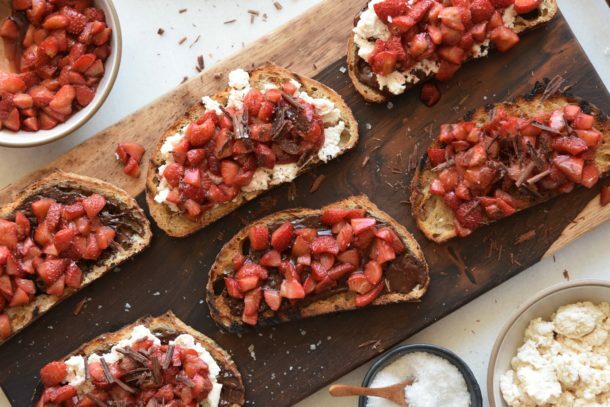 I called it a “Roasted Strawberry Bruschetta Bar.” I am always a fan of making people work for their food, and this is a great example. 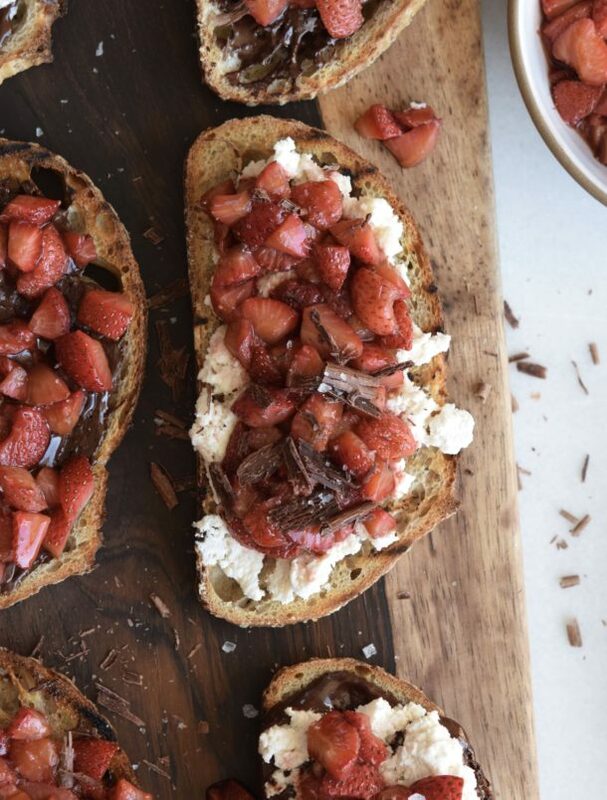 Put out a platter of warmed, lightly charred grilled bread, a bowl of sweet, roasted strawberries, some lightly sweetened ricotta, shaved dark chocolate and, wait for it, flaky sea salt! It is HEAVENLY. 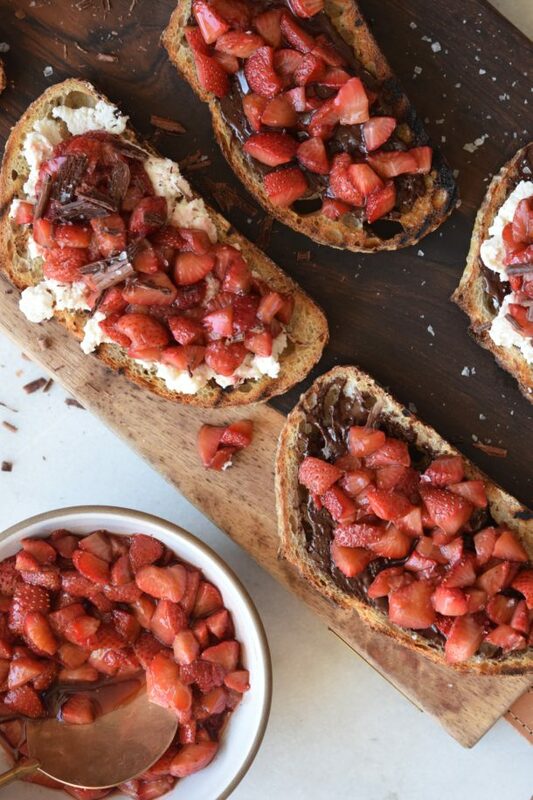 It’s ridiculously simple, but everyone will go crazy for these toasts, I promise. Here’s what I’m thinking — this would be so perfect for Mother’s Day breakfast or brunch or you could even serve it for dessert. It is a little messy to eat if you over do it on the strawberries like I always do. And if you’re going to take the time to prep strawberries for this recipe, just keep hulling and chopping because leftover roasted strawberries are incredibly good on oatmeal, pancakes, yogurt, ice cream, etc. For one of my cooking class groups, I had a bunch of gluten-free and dairy-free gals (or GF’s and DF’s as I like to refer to them.) So I found a lovely GF bread at a local bakery called Rising Hearts and I used Kite Hill almond milk ricotta. I actually used the Kite Hill ricotta in these images. It’s a game changer. No, this is not a sponsored ad (although I wish it was lol.) I am just obsessed with all their products. You can easily do this with lots of different toppings. In the fruit category, I would love roasted or fresh, ripe stone fruit, pears or figs. Instead of ricotta, you could use mascarpone or even smashed avocado. Chocolate or not, but I say chocolate. And the sea salt is an absolute must. It changes everything for the better. Trust me. If you want to wow your wife or mom, bring her a homemade goodie like this. It’s slightly decadent, but really not. Or if you are the mom and it’s your day off, make this the next time you have friends over or if you just want to have a special treat for yourself. Worth it. You and the toast! Preheat oven to 400 degrees. Pile the strawberries onto a large rimmed baking sheet lined with unbleached parchment paper. Sprinkle with sugar. Toss to coat and spread in an even layer. Roast strawberries for 15 minutes or until they soften and start to lose their shape. Meanwhile, preheat a grill to medium. Brush both sides of bread with oil. Grill bread on both sides until toasted and slightly charred, about 30-60 seconds on each side. Cut the bread in half crosswise and arrange on a platter. In a small bowl, mix together the ricotta and the honey/maple syrup. Spread a few tablespoons of the ricotta onto the grilled bread. Top with about ¼ cup of roasted strawberries and a pinch of flaky salt. Sprinkle with dark chocolate shavings, if desired. 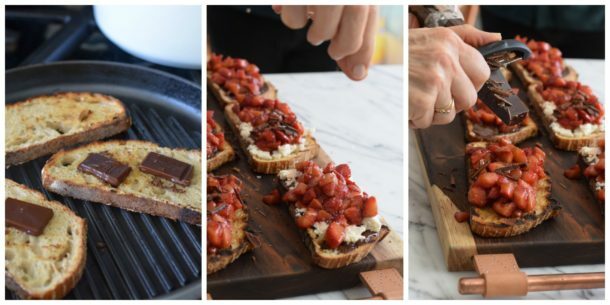 Another way to go is to grill one side of the bread, flip it over and immediately place a thin piece of dark chocolate on the top of the bread while it grills. You don’t need a lot, just a square or two. Remove from the heat and spread the melted chocolate with a knife. 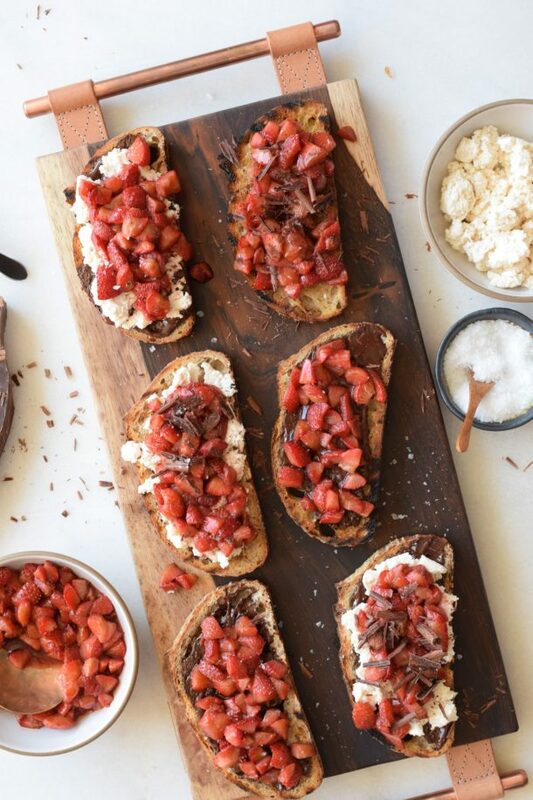 Top with roasted strawberries and ricotta if you like. I made this with the chocolate, ricotta and strawberries. It was heavenly!! What a nice treat. Every time I look at my strawberries in the refrigerator, I want to roast them! Thank you for something so yummy. And it’s the perfect thing to do with fruit that’s past its prime. No waste! So I have changed my diet drastically over the past month due to a stomach bacteria overgrowth problem. I am now eating plain sourdough bread with almost every meal. I do not snack and have cut all the super “healthy” foods everyone is talking about these days: raw veggies, kefir, probiotics, dairy unless lactose free, kale, brussel sprouts, broccoli, nuts and on and on and on. I have never felt better and my waistline is better! Here is bread!!! I hope people like you continue to incorporate it in their meal plans. It seems everyone is on the “against the grain” bandwagon and it’s a shame b/c it doesn’t work for everyone. Oh, I am definitely not against the grain! It’s not in my DNA to give up bread and whole grains! That said, I make a point of not overeating grains and bread because excess carbohydrates tend to raise blood sugar and/or put on weight for me. A good quality sourdough is hard to beat!